One of the most important and most beautiful Baroque gardens created thanks to the clever solution of František Maximilian Kaňka around 1720. 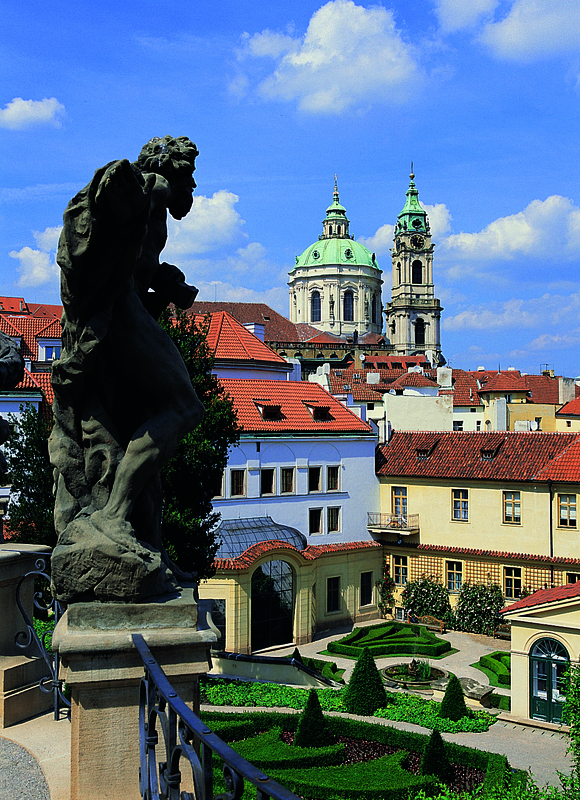 It’s one of the city’s smaller gardens, but its unique architectural design on an irregular slope as well as the artistic and historical value of its decoration ranks it high in importance in Europe. The garden is part of the Vrtbovský Palace no. 373/III. 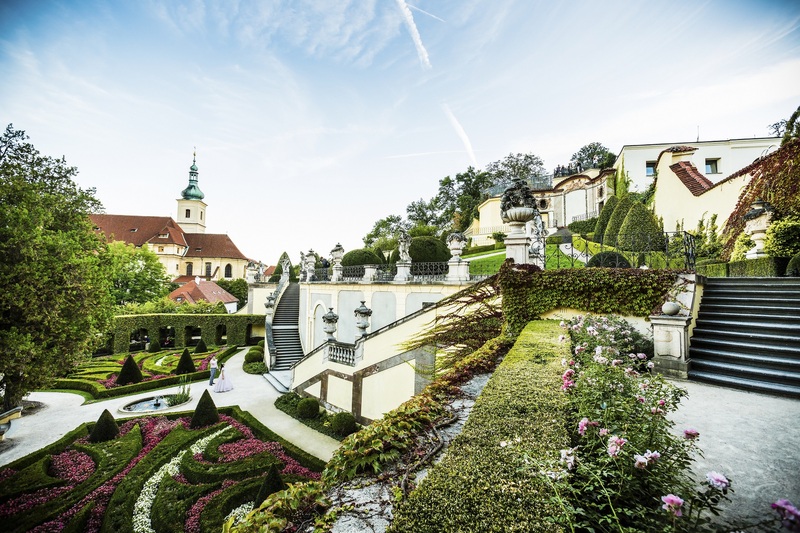 This city Italian-style palace garden is a gem among baroque gardens in the whole of Central Europe. Established on the site of the former vineyards around 1720 at Vrtbovský Palace. The owner Jan Josef Earl of Vrtba entrusted the building of the garden on Petřín hill slope to the architect František Maxmilián Kaňka. With its area of approximately 3,000 m2 it is one of the smaller historic gardens, nevertheless due to the originality of the architectural design of the irregular space on the slope and due to its artistic and historic value of decorations it is a gem of European importance. The entrance from the Karmelitská Street leads through the courtyard that leads to the entrance gate with statues of Atlant carrying Globe and two allegories of Abundance and Wealth by Matyas Bernard Braun (the original sculpture is now in the National Museum lapidary). The garden, which rises steeply up the hill, is situated on three terraced platforms, connected with staircases. The lowest floral terrace with a circular fountain in the centre is flanked with sala terrena on the left. It dates back to around 1720 and it is decorated with paintings on the vaults by Václav Vavřinec Reiner (Venus, Adonis and Allegory of Art), statues of Bacchus and Cerere by Matyas Bernard Braun and stucco by Tommaso Soldati. Opposite there is a symmetrically placed aviary. The staircase between the terraces is decorated with vases and statues of ancient gods from Matyas Braun: Apollon with a bow, Mercury, Diana and the dog, Juno with a peacock, Minerva with shield, Jupiter with an eagle and Vulcan with hammer. On the top terrace overlooking the area there is the pavilion, which once carried a decorative facade fresco by V.V. Rainer. The plastic decoration of gloriette had to be largely rebuilt. From here there is a beautiful view over the Lesser Town rooftops on the Prague Castle, the Cathedral of St. Nicholas and further on the Lesser Town and the Old and New Towns. Vrtba family kept the palace till 1799; in 1807 it was referred to the hospital in Karlov. In the years 1886 to 1889, Mikoláš Aleš lived here. The garden gradually decayed and was divided among multiple users. For 13 years the entry into the garden was forbidden due to state of disrepair (from 1985). From 1993 to 1998 the garden underwent an extensive renovation. Both buildings and the foliage were reconstructed. 15 tapered hornbeams, over 200 hornbeams in the hedges, 18 conical yews, 8 ball-shaped yews and tens of thousands of flowers and shrubs forming ornaments were planted here. The Vrtba garden was opened to the public in June 1998.